Have you made your mobile app?? If you can imagine it, its possible! Try integrating amazing 3D shapes and laws of physics into your virtual reality. Build your own interactive worlds through virtual reality. Explore the endless possibilities of 3D geometry and break the boundaries of the physical world with HTML5 and WebVR. Click here to see our students work in virtual reality creation. Virtual reality .. here we come!! At KidoCode, VR is a place where math and art are combined with the power of coding to create truly engaging environments. Learning to use VR tools to create immersive experiences is a must for future knowledge workers, with people from all fields looking to integrate VR into their existing businesses. We're at the forefront of VR, and are excited to bring VR creation into our program. get into reality mode!! unless you've lived under a rock for quite some time, you've likely heard that virtual reality technology is heading towards mainstream adoption. this means that the wearable screen landscape is modling itself into three unique areas: augmented reality (ar), mixed reality (mr), and virtual reality (vr). the term "virtual reality" simply serves as a sort of umbrella term for the whole space, simply because it was coined first in 1987.
what you will do? in our vr creation module, you'll learn about creating 3d geometries, and interactive environments, using html5 and webvr to build fantastic new experiences that combine audio, visual, haptic and sensory feedback. come join us and have fun!! ready to simulate? virtual reality (vr) is the use of computer modeling and simulation to enable human interaction with an artificial three-dimensional (3-d) visual or another sensory world. vr applications immerse the user in a computer-generated world that simulates reality through the use of interactive devices, that send and receive information. 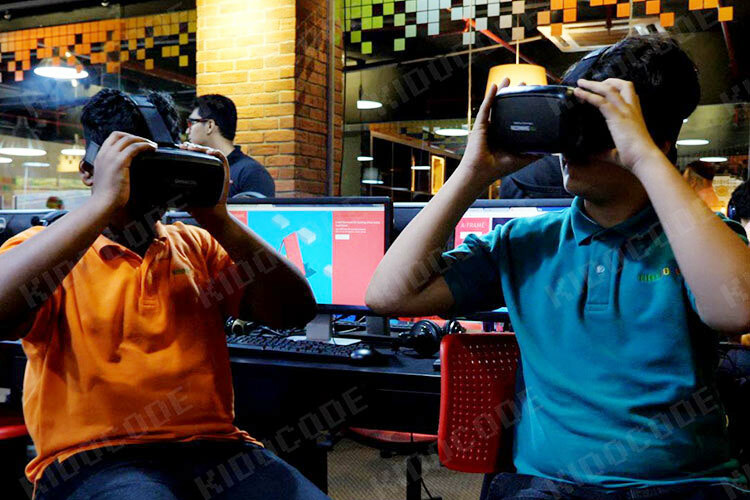 these interactive environments are certainly part of the future of our experiences, so try building your first ever vr world at kidocode now! "Oh, yes! You can become a Virtuoso!" WebVR is an open specification that makes it possible for people to experience VR in their web browsers.Enjoy the experience while at kidoCode. A-Frame is used for building virtual reality (VR) experiences. It is maintained by Mozilla and WebVR community using Three.js where developers can create 3D and WebVR scenes using HTML. Any plan for schools break?